After a great three-week run, US equities kicked off the week on a disappointing note Tuesday. 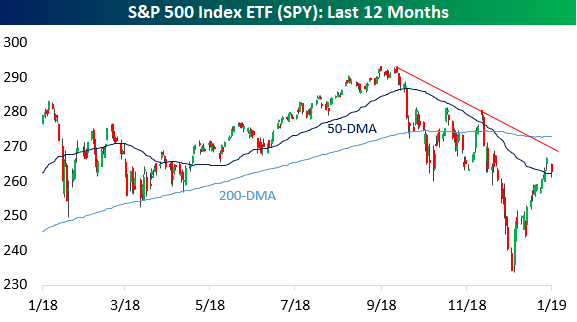 After just barely closing above the 50-day moving average (DMA) last week, bulls were hoping the next milestone for the rally off the Christmas Eve lows would be the downtrend line from the September highs, but the market had other plans. After falling as much as 2% and back below the 50-DMA heading into the final hour of trading, the S&P 500 rallied 0.60% in the final 60 minutes of trading to finish the day down 1.4% but above the 50-DMA. After a strong run like the one we had over the past few weeks, at the very minimum, a pause was expected, and the fact that the S&P 500 was able to once again rally in the final hour of trading is something for the bulls to hang their hats on. Besides the fact that the S&P 500 showed some life into the close, Tuesday’s sell-off came on extremely low volume which provides some consolation. Whereas market sell-offs are almost always accompanied by an uptick in volume, volume on Tuesday was notably below average. In fact, SPY volume was 13% below average coming in at under 110 million shares. For the sake of reference, the last time the S&P 500 was down 1%+ and volume was more than 10% below average was almost a year ago in late February 2018 and between then and now, there have been 28 other days where the S&P 500 was down over 1% where volume was higher relative to its 50-day average.